One of the most popular and whacky activities to include in your itinerary. Kitted up in as much tartan as you can handle, including possibly a hat & wig, you'll do tug of war, welly wanging, the farmers dash, tossing the caber and more! This is one of the most popular and whacky activities to include in your itinerary. For those looking for something fun, energetic and challenging this is right up your street. This activity comprises a range of games, bought to you from the Scottish Highlands. On arrival you'll be kitted up in as much tartan as you can handle, including possibly a hat & wig and kit to wear for the games. 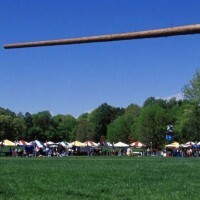 You'll be split into teams for a range of Highland games, which may include tug of war, welly wanging, the farmers dash, tossing the caber and more! Rest assured there will be plenty of photo opportunities to take away plenty of memories from your event. The event will be fully supervised by experienced and trained marshals, who are available to offer any support and guidance. Enjoyable in all weather, you can't go wrong with this affordable activity option. Give us a call now to get the ball rolling for your weekend.